The Gartenappartement Kirchdorf is a ground floor apartment in the historic center of Brand. The entire building has a parking garage as well as a ski and bicycle room. 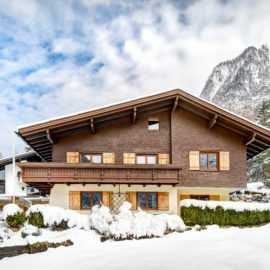 The entire Kirchdorf is located in a quiet location. The Gartenappartement Kirchdorf is specially aligned against the Alvierbach and allows an unobstructed view of the meadows and the Alvierbach. In winter, the ski bus stops 30 meters from the front door. This commutes between the two ski lifts Dorfbahn and Palüdbahn – you are in a few minutes at one of these feeder trains. The village trail leads through the garden. In summer, you can board directly in front of the door or directly from the garden into the hiking network. 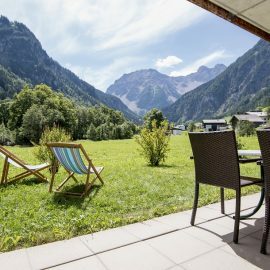 The terrace offers a beautiful view of the meadows, the Alvierbach and the mountains. Children can play here carefree and without any danger of traffic and let off steam. The apartment has a room with a double bed and a large living room with two more beds, which can be folded down by a closet. 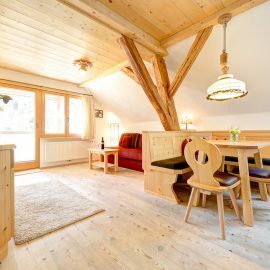 The Gartenappartement Kirchdorf offers enough space for 2 adults and 2 children. The village center is 8 minutes walk or 2 minutes by bus.